Nguyen Huu Thanh, director of Vietfoods in Can Tho, specializing in shrimp export to Japan, predicted the yen depreciation would be detrimental to export in 2013.The yen depreciation is forecast to adversely affect exports to Japan, the main market for many export items of Vietnam. The Japanese yen on Thursday slightly firmed against the U.S. dollar, but it still stayed at a 29-month low, with 87.26 yen in exchange for one U.S. dollar. In 2012, the greenback appreciated 12.8% against the yen, the highest level since 2005, while Vietnam dong has been closely pegged to the dollar. The appreciation was sharp in the final months of the year. In comparison with November 2012, the U.S dollar has appreciated 10% against the yen, according to Reuters. Nguyen Huu Thanh, director of Vietfoods in Can Tho, specializing in shrimp export to Japan, predicted the yen depreciation would be detrimental to export in 2013. “The government of Japan is seeking to depreciate its currency. In my opinion, the yen in the coming time will likely depreciate to the rate of 90 yen to the U.S. dollar. This means Vietnamese products will be more expensive. Japanese will cut down consumption or ask suppliers for discount,” he said. Vietnamese shrimp prices are now US$2.3 per kilo higher than the same products of Thailand and India, which will pile more pressure on local shrimp exporters, Thanh said. The reason for rising production costs in Vietnam no longer lies within factories, he said. “The reason for higher production costs of Vietnamese shrimp comes from the stage of farming, not from processing plants. The planning for a standardized shrimp farming zone has been mentioned for years, yet there has been a modest improvement,” he said. 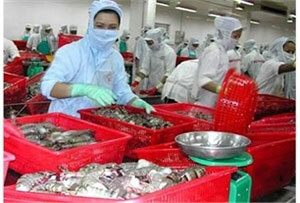 Le Van Quang, chairman of Minh Phu Seafood Corp., said prices in Japan were always better than in other markets. Still, there are technical barriers in the Japanese market. Now, as the yen is depreciating, the situation will be more difficult, he said. Huynh Van Nghi, general director of Phan Thiet Garment Export Joint Stock Company in Binh Thuan, told the Daily that the yen depreciation might not affect export volume. However, local exporters will hardly raise prices even though input costs will continue to surge. Export efficiency will be impacted, but the level of impact cannot be measured at the moment, he added. Meanwhile, Pham Tuan Kien, director of Tan Chau Garment Export Co., forecast the yen fall against the dollar would have little impact. Vietnamese apparels made of materials originated from ASEAN countries enjoy preferential tariffs in Japan, so their competitive advantage in this market will remain intact, he explained. Because of the gloomy situation in the EU, Japan is becoming a key market for Vietnamese apparels and leather-footwear products. Japan is currently the main market for the major export items of Vietnam like textile-garment, shrimp and plastic products. In the first 11 months of 2012, Vietnam exported US$1.79 billion worth of textile-garment to Japan, up 17% year-on-year, accounting for 13% of the total export turnover of the industry. Meanwhile, footwear exports to this market brought in US$299 million, a year-on-year surge of 34.6%, standing at 4.5% of the total export turnover of this item, according to the General Department of Customs. Statistics of the Vietnam Association of Seafood Exporters and Producers (VASEP) show that Japan is now the biggest shrimp importer of Vietnam, representing 27.7% of the total shrimp export turnover of US$2 billion in the first 11 months of 2012. The Vietnam Fisheries International Exhibition (Vietfish) will be held at the Saigon Exhibition and Convention Centre (SECC) in Ho Chi Minh City from June 26-28. The event, organised by the Vietnam Association of Seafood Exporters and Producers (VASEP), has drawn the participation of 175 businesses to showcase machinery, equipment and services on 330 stands. One third of the stands represent enterprises from Thailand, the Republic of Korea, Japan, France, India, Norway and the US. The event has also attracted booths from foreign organizations such as the Bangladesh Fisheries Society, Thaifex 2012-World of Food Asia, the Shanghai Exhibition (China) and the Global Aquaculture Alliance. Businesses will have the opportunity to introduce their products at the exhibition, seek partners, and expand their markets. They will also be able to gain useful, updated information at seminars on the new regulations for exporting goods to the US. The Ministry of Agriculture and Rural Development (MARD) forecast in 2010 the Mekong Delta will export600,000MT of Pangasius products, valued at US$1.5 billion, an increase of nearly US$160 million comparedwith 2009.